I always find it easier to buy for girls that for guys. Not just adult women/men but kids, too! I think the kid factor is because I just have daughters. Any time I have to buy a gift for a boy I feel like I am in a foreign country when in the ‘boy toy’ aisle. The same goes for grown men, too (sometimes). Girls are just so much easier. For the most part, we are happy with just about anything from a good bottle of wine, to a candle, to a piece of jewelry! 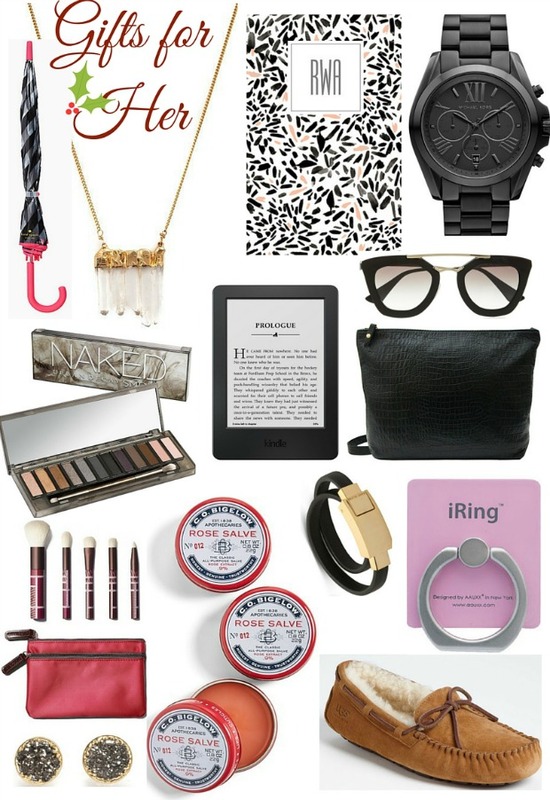 Check out my gift guide for the gal in your life. I may have included a few things on there that I have been lusting after. My husband and I aren’t exchanging this year, but my birthday is not long after Christmas so I’ve got my list started! Kate Spade Umbrella: I have a large umbrella like this and it is perfect. A cute umbrella might not be something a gal would buy herself, so this would be the perfect necessity-but-a-cute-necessity gift! Robyn Rhodes Charlotte Crystal Necklace: This hand made crystal necklace is perfect for layering and is one of my favorite Robyn Rhodes pieces! May Designs Agenda: I looove agendas. In fact, I don’t know another woman who doesn’t go crazy over new planners, stationary, etc. I have been using May Designs for the last couple of years. They are great gifts because they are affordable, and can be personalized. They offer everything from agendas, to baby/bump diaries, budget journal, meal planning journal, adult coloring book, and even kids handwriting books! Michael Kors Bradshaw Watch: Ok so this is on here more because it is something I want (you catch that, Ryan?). I saw it months ago and couldn’t bring myself to buy it, so I figured the holidays/my birthday is the perfect time! I love that it isn’t quite feminine, but would still look cute on a dainty wrist, or stacked with the perfect bangles. Urban Decay Naked Smoky Palette: What girl wouldn’t want this for Christmas? Could double as a stocking stuffer, too! Amazon Kindle: This is such a great gift. My husband got this for me several years ago and I use it all the time. Don’t get me wrong, every once in a while I do buy an actual book, but having a Kindle is so convenient. And to be honest, with iPads, and smart phones, you really don’t need any extra bells and whistles on a Kindle. If you are like me, you will literally just use it to read! Nasty Gal Sunglasses: Sunglasses can be tricky, because you never really know how they will look on someone. I have found these particular ones to be flattering on a lot of different face shapes. Plus, they are super affordable! Blair Ritchey PAK: Ok, another thing that is on my list. I.Want.This. That is all! Seriously though, her quality is great, everything is Made in the USA, and the pieces are so versatile and functional. I love everything of hers that I have and know I would love this just as much! I think any fashion love would love this (or anything from Blair’s collection) under the tree! Makeup Brush Set: Something simple enough, but worth it! Rose Salve Lip Balm Trio: This stuff is amazing. I first used this about two years ago and fell in love with it! It can be used pretty much anywhere, not just your lips. I have used their products on my feet before, and it works wonders! Anne Klein Charging Cable Bracelet: I don’t know about you, but I am always draining the battery on my phone. I have a portable charger thing, but I forget it at home a lot. The charger in my car is pretty terrible, too so this is something that would come in handy. I am pretty sure having your charger double as a bracelet would make it difficult to forget! iRing: This thing is life changing! My friend introduced this to me last year. I thought it couldn’t really be that awesome. It is. I am telling you, any busy woman/mom/human being needs one of these. It adheres to the back of your phone, essentially attaching a ring to the back of your phone. I loop my finger through the ring and carry it that way 99% of the time. It keeps my phone handy but frees up my hand to shop, carry my bags, etc. It also makes taking selfies a whole heck of a lot easier, too! It comes with a dashboard mount as well so if you use your phone for music or navigation in your car you can see it clearly! Robyn Rhodes Amelia Druzy Earrings: A raw, natural druzy, and Made in the USA. These simple studs are perfect for any outfit and are a safe purchase for anyone with pierced. UGG Slippers: Just like my husband, I buy a new pair of inexpensive slippers every year. They last through the winter and that’s about it. These are on the more expensive end, but I know they will last more than one winter. They are definitely a good investment! I've been eyeing the Michael Kors Slim Runway watch this year. Black stainless steel strap with gold!